Several of my friends have recently given up their gym memberships to save some badly needed bucks by working out at home instead. To do that properly, you need some equipment. 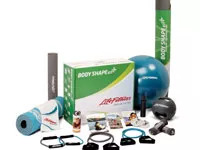 Life Fitness, the folks known for their treadmills and elliptical trainers, are seeking to rise to the occasion with their new Body Shape Kit and Body Shape Kit Plus. Several of my friends have recently given up their gym memberships to save some badly needed bucks by working out at home instead. To do that properly, you need some equipment. Life Fitness, the folks known for their treadmills and elliptical trainers, are rising to the occasion with their new Body Shape Kit and Body Shape Kit Plus. The Kit Plus also includes an 8-pound medicine ball, a foam roller, and an equipment mat to go under your treadmill or elliptical (assuming you have one; more on that below). The heart rate/pedometer watch is relatively easy to program and it measures your heart rate via a fingertip sensor on the watch face, so you don’t have to wear a pesky chest strap. But I was suspicious of the pedometer from the get-go—how accurate could it be, attached to a body part completely unconnected to your lower half? Not very, it turns out. I put it on and sat at my desk. By the time I stood up, I’d already “walked” 21 paces. It wasn't much more accurate once I started walking. The two DVDs offer four different circuit workouts, all 30–35 minutes long. The strength moves are interesting, using all of the equipment in the kit (a really nice variety), and the instructor gives a lot of good form tips. You have a choice of levels to follow, too—basic or more challenging. That’s all good. I had an issue, though, with the cardio portions of the circuits. The Life Fitness folks assume you own a cardio machine (preferably one of their treadmills or ellipticals is the message I got). The instructor makes a half-hearted mention about how you can go walk or bike outside instead, but really, who’s going to pause a DVD to go walk or bike outside for five minutes? The other pieces in the kits are well-made and of obviously good quality. I wonder, though, about only including 3-pound hand weights; unless you’re a complete beginner, those aren’t going to last you very long, and you’ll need to buy heavier ones in order to keep building strength. Maybe in the future, Life Fitness could offer a choice of weights, depending on your level of experience and strength. One more thing worth noting: You get a lot in these kits, but they’re a little pricey. I did some googling to find items of comparable quality and determined that I could put my own kit together for around $200—and that’s including the extras in the $399 Plus version. Sure, it’s easier to just order them together, but is that convenience worth paying twice as much? With a few tweaks from the company, it might be. Are you listening, Life Fitness? Pros: The kits include an excellent variety of equipment, all of good quality, equaling an easy way to put together an almost-complete home gym. The instruction on the strength portions of the DVDs is solid, and the heart rate watch is easy to program and use. Cons: The pedometer feature on the watch is inaccurate, the DVDs assume you own a cardio machine, and the hand weights are too light for most exercisers. Also, the kits are a little pricey. Extra tip: Use the Workout Program Calendar in the “Your Personal Body Shape Plan” brochure, which comes with the kits, to help you set up an effective weekly workout plan.